Product #20898 | SKU TBC405 | 0.0 (no ratings yet) Thanks for your rating! 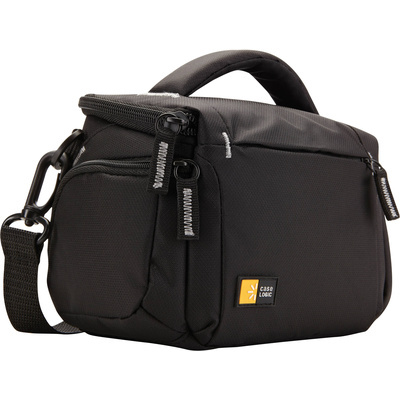 The black TBC-405 Camcorder Case from Case Logic is designed to handle your compact camera with two small lenses or camcorder. The interior contains a divider that helps you configure the inside to suit your equipment needs. The case is made from a strong Dobby nylon and thick interior padding, all manufactured to protect your gear from the inevitable bumps and abrasions that we all encounter during a day outside. For accessories, there are three exterior zippered pockets plus one additional internal zippered pocket for small stuff such as memory cards or batteries. Access to the inside is via dual zippers that are supplied with handy pull tabs. The tabs will serve you well when you're wearing gloves. The case is carried by its adjustable, removable shoulder strap or top carry handle. Case Logic offers a 25-year warranty with this reasonably priced, easy to use and fully functional case.